Fall. My favourite season. I just love this time of year, the changing weather, the new beginnings and of course, the arrival of pumpkin spice everything! To kick off pumpkin season, I decided to go with a simple, yet very decadent and oh-s0-delicious, vegan pumpkin pie fudge. This stuff is to die for. Oh man, it’s so good. The texture came out perfectly and it’s downright dangerous having a batch in my freezer at this very moment. It’s smooth and creamy and melt-in-your-mouth pumpkin pie perfection! 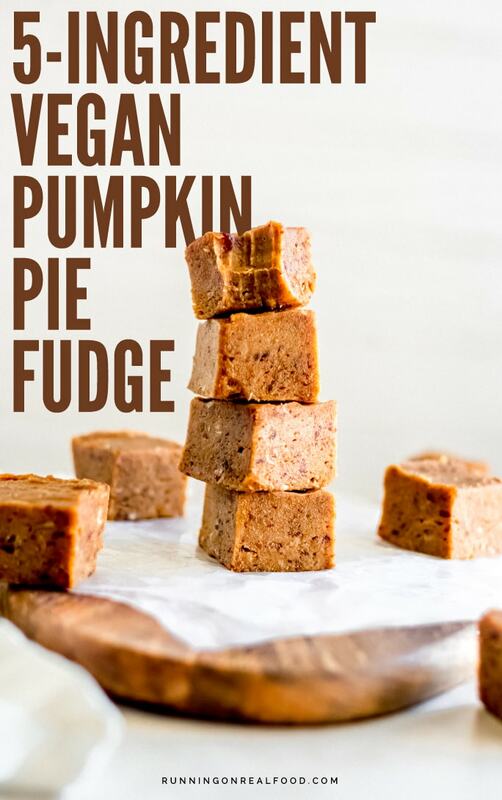 You only need 5 basic ingredients to make this fudge: medjool dates, pumpkin puree, pumpkin pie spice, coconut oil and peanut butter. Once you assembled your ingredients and are ready to go, it’s simply blend, smooth into a pan, set in the freezer, eat and just try to resist eating more. This recipe is no-bake, so there’s not much to it. Just add all the ingredients to a food processor or high-speed blender to create a creamy mixture then spread that into a pan and place in the freezer to set. I lined the pan with parchment paper so I could easily lift the finished fudge out of the pan. Saran wrap or wax paper would also work. To neatly line a loaf pan with parchment or wax paper so it lays flat, measure the length, width and height of your pan. Cut one piece of parchment to the width of your pan and one to the length of your pan, keeping them both long enough to hang out over the sides of the pan. Place the wider sheet into the pan first then layer the longer one top of it. I hope that makes sense, I’ll get a photo next time I do this! 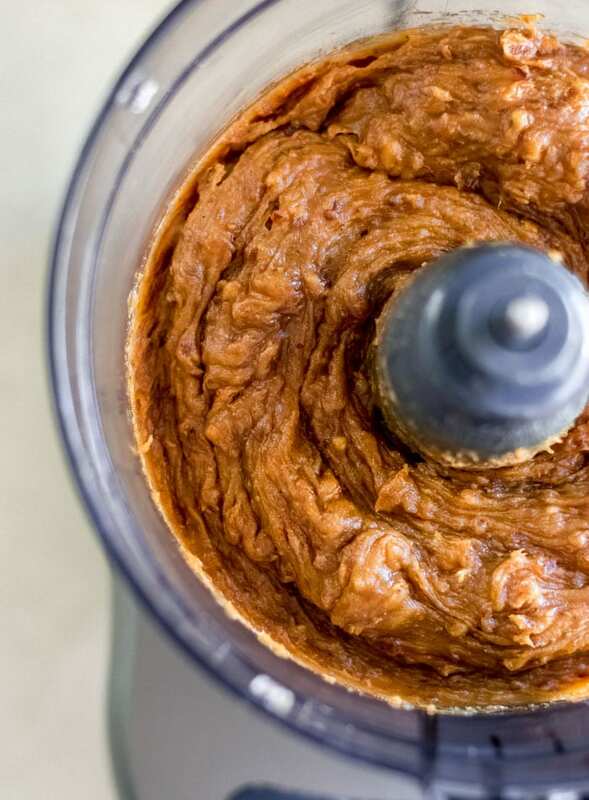 As for the nut butter, you can use almond butter, peanut butter, cashew butter or another nut butter of course. I haven’t tried it with tahini or sunflower seed butter but that would probably be really good too! This recipe calls for soft, fresh medjool dates. If you don’t have soft dates, soak them in hot water for 15 minutes and drain before using. If you don’t have medjool dates, that’s ok. You’ll need about double that amount in a small date such as a sayer date or deglect noor, or 400 grams before they’re pitted. Enjoy, my friends! This fudge. This season. This weather. Pumpkin everything. Happy Fall. 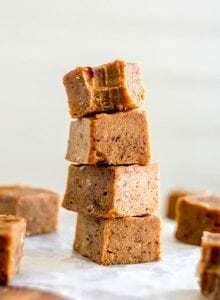 This decadent, whole-food based fudge only requires a few, plant-based ingredients to make and will be sure to satisfy your sweet tooth. It’s smoothy and creamy and tastes just like pumpkin pie! Place all ingredients in a food processor or high-powered blender and process until smooth. 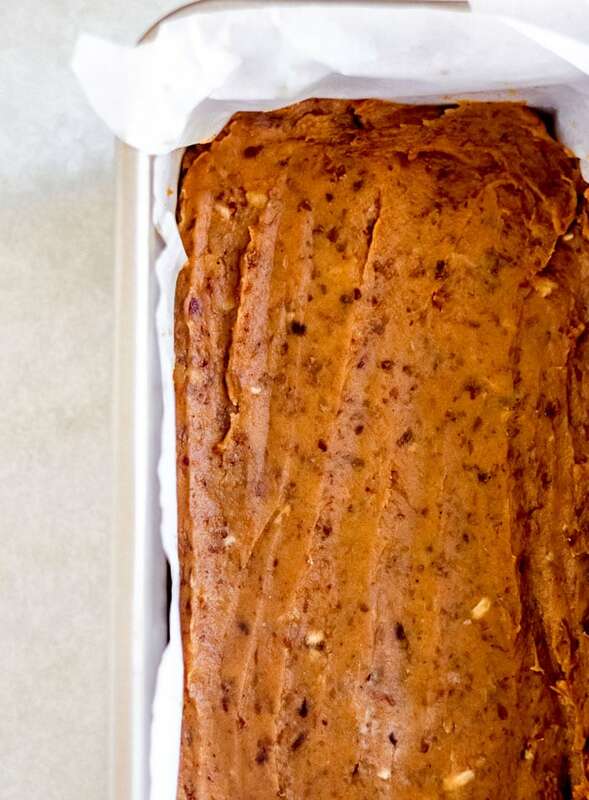 Spread the mixture into a wax or parchment paper-lined loaf pan. Place the pan in the freezer to set for at least 3-4 hours. Remove, lift out of pan, cut into 24 pieces and enjoy! Store in the freezer in a container. If you have a peanut allergy or to make it paleo, you can substitute almond butter for the peanut butter. Just make sure it’s not too drippy. This looks amazing – love it. 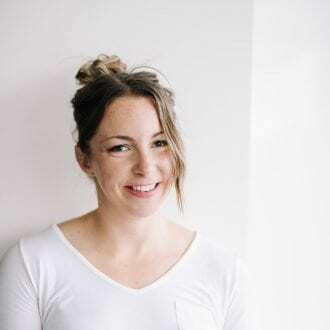 Have posted this on my Pinterest board and FB site. Cannot wait to try it! 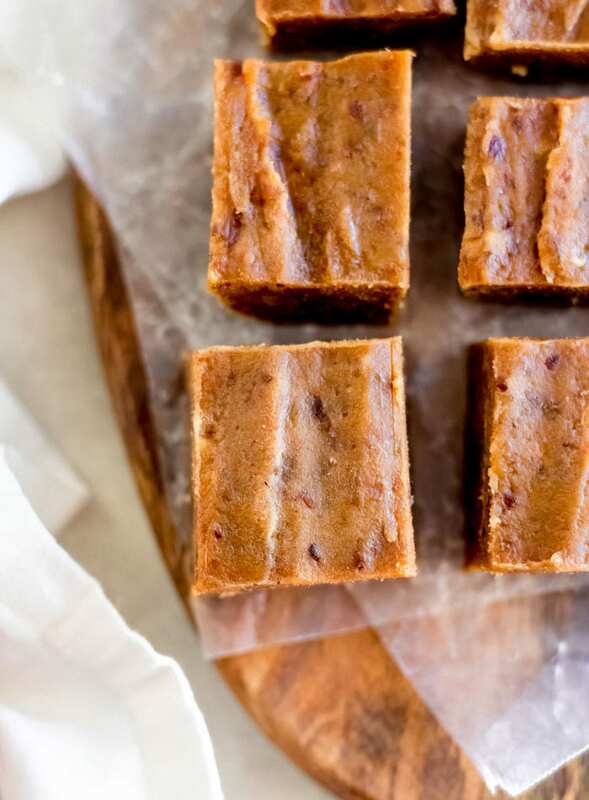 pumpkin fudge that is healthy and made with 5 ingredients? yes PUHLEASE! You had me at pumpkin pie fudge! I’m not vegan but will be trying this out. Perfect to get into the fall spirit! Definitely! It’s super yummy, enjoy! What is the actual quantity of pumpkin puree? Your recipe just say “1/2”? Oh, oops! Thanks for catching that! It’s 1/2 cup of pumpkin. Thanks!! This looks amazing! Seriously, dates make everything better! Is there a substitute for the oil? I’m on a plant based diet that eliminates any oil. For this recipe, unfortunately not. The coconut oil is necessary for them to harden. Hello Deryn. Pumpkin has some great nutritional benefits. I like to use fresh whenever possible. This recipe would work great if you used the pumpkin out of your garden. Can you suggest other recipes for pumpkin, please? I’m surprised you didn’t use Earth Balance coconut spread instead of the coconut oil. Wouldn’t that work? It can be out of the freezer for a little while but they will melt and get soft at room temp. Enjoy! This looks heavenly! I like to combine peanut butter and dates for a thick spread, but hadn’t thought to add pumpkin. Delicious I bet! Oh, I love that idea too! 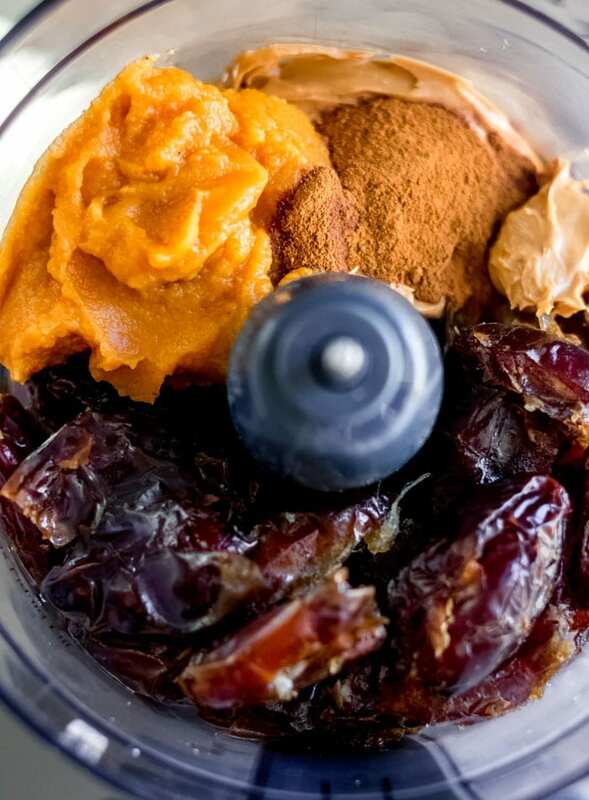 I love making date caramel and paste just from dates but I love the idea of mixing it with peanut butter or almond butter to make a sweet spread! !